it has been wonderfully sunny and cool this entire week, but the last week and a half was another story. after my earlier post on the difficulties of adjusting to the sweltering Shanghai heat, i rifled through my clothes, and realized nothing i had packed (with the exception of some dry-clean only, dressy-ish silk tanks) was sufficiently airy, wash-and-dry, yet still 'coverage-appropriate' for stylish local dressing. apparently baring shoulders is a no-no, but tiny shorts are ok...go figure! so, with a mission to find a loose, blousy shirt, i went down to the shops at Tianzifang to take a look. i wanted to find something special and well made, not just a throwaway piece that i'd get rid of if i ran out of space in my suitcase. at Ling boutique, i found exactly what i was looking for. there are some things that i find myself looking for every season, regardless of the trends. 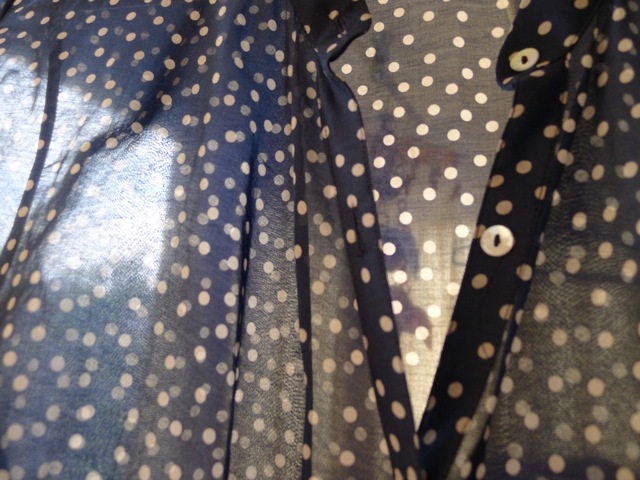 a polka dot shirt is one of these perennial favorites. i'd describe everything at Ling as Japanese-inspired avant-garde meets Buddhist monk. their signature buttondown shirt embodies these design elements: airy and ever-so-slightly monastic inflections in a flowy silhouette and easy cut. 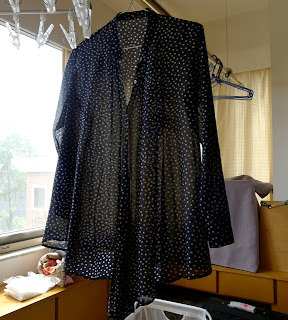 the shopgirl showed me how to wear it three ways, as there are some extra mother-of-pearl buttons that allow you to ingeniously fasten the fabric to create different silhouettes. i immediately fell for the navy and cream polka-dot signature shirt, and also happily found a lovely grey houndstooth one in the sale rack. these two shirts are the first purchases i've made in Shanghai, and i really love them both. i've been thinking about how to do wardrobe planning for this year, and i'm leaning towards making some carefully considered purchases from Shanghai designers and concept boutiques that will serve as either wildcard or collection items. will do a more detailed post on that soon! Love the navy, you will get so much wear out of it. Would love to reach your version of a shanghai shopping guide after you have had a little more time to settle in. 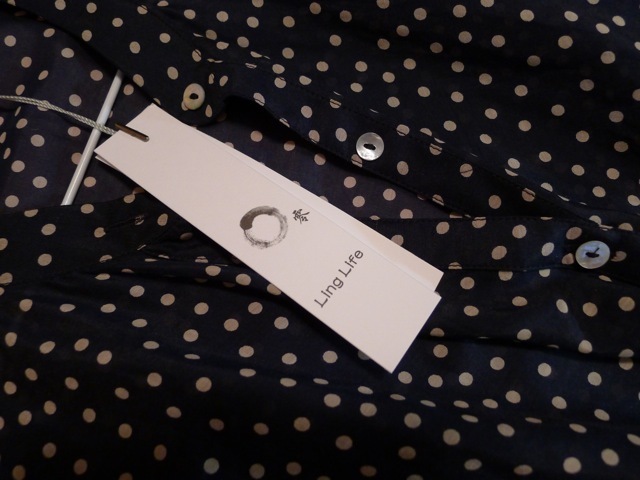 Ling sounds like a gem of a boutique. "Japanese-inspired avant-garde meets Buddhist monk"-- I love that, sounds like a great store. Have you heard of MixMind? The designer, Ma Ke, was featured in Selvedge magazine a while back and she is supposed to have stores all over China. Congratulations on your first Shanghai additions! I particuarly love the navy - the drape and fabric look beautiful. Nice! I find that I cannot wear silk when it's super hot out. How do you like the cotton-silk combo? I assume it breathes a little better. @Ammu i'd be happy to do a series of shanghai shopping posts here. there are some really great hidden gems and established talents here! so much inspiration and i've only been here for 2 weeks. These are wonderful! I love that they are so versatile - not only in color and style but also in ease of wear. I think you'll get much use out of them in all seasons. They'd look great peaking out of a blazer or leather jacket and can double as an edgy cardigan/wrap over a simple tank in warmer weather when baring the shoulders is a faux pas. @jennifer i have another cotton-silk shirt and it breathes really well; these shirts from Ling are quite a fine weave, so they're probably the airiest ones in my closet. Love to hear what you're finding over there. Any chance you could include prices? I'd be super interested, if possible. @LPC just updated my post for you! did you do much browsing when you were in shanghai? find anything cool? The polka dot one is especially lovely. 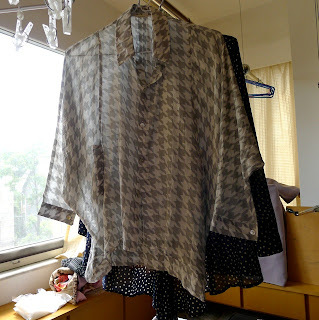 I like silk cotton a lot too, although you almost always have to wear a tank underneath, because they're so sheer. But they're still much more wearable than silk shirts in the heat. Please do a shopping guide once you've settled into the city - that would be great! I never had time to shop much:(. Thanks for updating the post. They're lovely! I love fine weave shirts and the airiness that come with them. I'd love to see how you wear them. Lovely blouse that's definitely making me reconsider polka dots.